Abstract. In the upper troposphere and lower stratosphere (UTLS), the accurate quantification of low water vapor concentrations has presented a significant measurement challenge. The instrumental uncertainties are passed on to estimates of H2O transport, cloud formation and the role of H2O in the UTLS energy budget and resulting effects on surface temperatures. To address the uncertainty in UTLS H2O determination, the airborne mass spectrometer AIMS-H2O, with in-flight calibration, has been developed for fast and accurate airborne water vapor measurements. 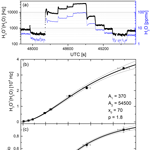 We present a new setup to measure water vapor by direct ionization of ambient air. Air is sampled via a backward facing inlet that includes a bypass flow to assure short residence times (<0.2s) in the inlet line, which allows the instrument to achieve a time resolution of ∼ 4Hz, limited by the sampling frequency of the mass spectrometer. From the main inlet flow, a smaller flow is extracted into the novel pressure-controlled gas discharge ion source of the mass spectrometer. The air is directed through the gas discharge region where ion–molecule reactions lead to the production of hydronium ion clusters, H3O+(H2O)n (n = 0, 1, 2), in a complex reaction scheme similar to the reactions in the D-region of the ionosphere. These ions are counted to quantify the ambient water vapor mixing ratio. The instrument is calibrated during flight using a new calibration source based on the catalytic reaction of H2 and O2 on a Pt surface to generate a calibration standard with well-defined and stable H2O mixing ratios. In order to increase data quality over a range of mixing ratios, two data evaluation methods are presented for lower and higher H2O mixing ratios respectively, using either only the H3O+(H2O) ions or the ratio of all water vapor dependent ions to the total ion current. Altogether, a range of water vapor mixing ratios from 1 to 500parts per million by volume (ppmv) can be covered with an accuracy between 7 and 15%. AIMS-H2O was deployed on two DLR research aircraft, the Falcon during CONCERT (CONtrail and Cirrus ExpeRimenT) in 2011, and HALO during ML-CIRRUS (Mid-Latitude CIRRUS) in 2014. 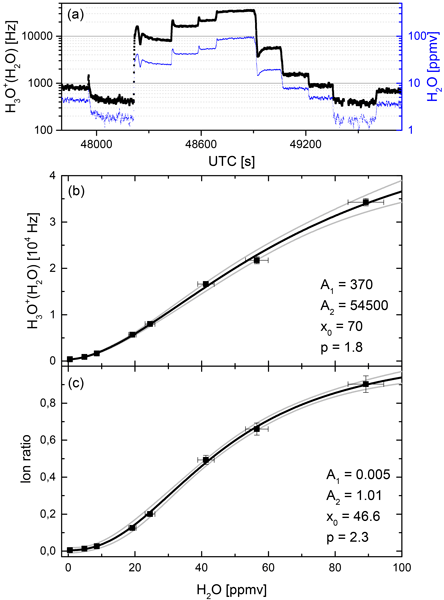 The comparison of AIMS-H2O with the SHARC tunable diode laser hygrometer during ML-CIRRUS shows a correlation near to 1 in the range between 10 and 500ppmv for the entire campaign. How to cite: Kaufmann, S., Voigt, C., Jurkat, T., Thornberry, T., Fahey, D. W., Gao, R.-S., Schlage, R., Schäuble, D., and Zöger, M.: The airborne mass spectrometer AIMS – Part 1: AIMS-H2O for UTLS water vapor measurements, Atmos. Meas. Tech., 9, 939-953, https://doi.org/10.5194/amt-9-939-2016, 2016. We present the development of a new airborne mass spectrometer AIMS-H2O for the fast and accurate measurement of water vapor in the upper troposphere and lower stratosphere. The high accuracy needed for e.g. quantification of atmospheric water vapor transport processes or cloud formation is achieved by an in-flight calibration of the instrument. AIMS-H2O is deployed on the DLR research aircraft HALO and Falcon where it covers a range of water vapor mixing ratios from 1 to 500 ppmv.